My interest in angling began when I was a youngster my father took me to a local soccer match between two local teams that left me scarred for life and desperately seeking a worthwhile pastime. I found it in angling and over the years I have developed a keen interest in anglings rich and varied history. Along the way in my quest for more knowledge of our noble sport I have come across many oddball rumours and tales past down in folklore. Take the Bishops reel; centuries ago in merry old England monasteries were dotted around the countryside mostly opulent buildings set in their own grounds granted by royalty or some rich nobleman intent on saving his soul. These establishments were self-sufficient growing and farming their own food and were benevolent to the local community many had their own trout lake. Bishops and their entourage would visit the various monasteries in their domain at regular intervals to participate in and promote the rituals and practices of the church and there were many ceremonies to be indulged. At noon each day the trout would be fed by the monks as they were for use on special occasions a local craftsman would have been employed to build a reel ornate enough to please and be in keeping with the bishops status. 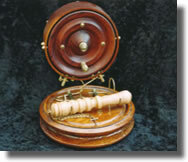 Most English anglers at this time favoured the free running Nottingham centre pin these individual reels introduced innovation and design, which has helped tackle to evolve into what we know today. Just before noon a novice monk selected for his devotion would attach the bishop’s reel to the rod in this case a twin line close face drum so that the bishop could catch a fish for his guest as well. At noon as the feed was thrown in, the novice handed the rod to the bishop who ceremoniously lowered the bait to the water where the trout in their feeding frenzy impaled themselves. The bishop then handed the rod back to the novice who reeled in the fish detached them from the hooks presented them to the bishop who with dignity and grace despatched them with the priest. That evening dinner would be served and the bishop content in his mind at the honest labour he had performed to earn his meal would regale his guest with fishy tales of the fight he had endured with the beast to provide him with such a sumptuous repast. The novice monk he returned to his cell with a bowl of gruel and the job of untangling the lines and cleaning the tackle whilst dreaming of what he would do when he made bishop.